Unfortunately, the Underground Manchester tours are still suspended, so please don’t e-mail us with requests to do the tour. We keep getting such requests and, sorry, but we don’t have time to respond to them. We are busy with our other 150+ tours! We are doing everything we can to get them back. If you think the tours should re-start petition Tobermory, the owners of the Great Northern leisure centre. From the past, a description of our tour. One day it might well restart! 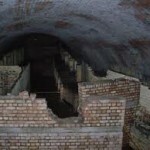 *** This is the 2-hour de-luxe Underground Manchester tour into the city’s biggest WWII air-raid shelter, built into an old subterranean canal. It’s the tour featured in the Manchester Evening News, Daily Telegraph and on Granada Reports. But please take note, this is only suitable for those with no walking or respiratory difficulties. There are around 50 steps from the entrance to the tunnels, slippy steps within the tunnel complex and one 20-inch drop that can be tricky. Entrance at your own risk! 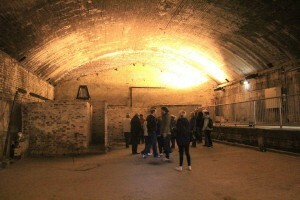 Next public 2013 tours: Pre-bookings only, please, through www.quaytickets.com, 0843 208 0500. Note new Youtube video below. New dates will be announced as soon as we have clearance. 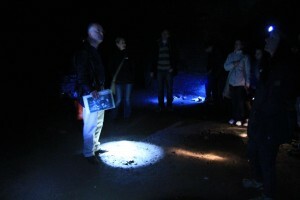 Private tours for large groups: please e-mail info@newmanchesterwalks.com. Meet: outside the Midland Hotel, Peter Street, M2 3NQ. Bring: Torch and stout footwear. Children: Unsuitable for children. Cost: public tours (cost: to be decided); private tours (cost: to be decided). Beware: Uneven surfaces and slippery steps in the tunnels. We’d rather you didn’t slip on the steps, stumble around in the dark or fall into the canal, so it’s essential to wear sensible footwear and bring a torch. NMW will make every effort to ensure safe passage for everyone on the walk but will not be held responsible for any injuries sustained. *** What’s it all about? 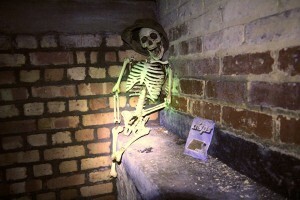 New Manchester Walks has devised a remarkable tour about the mysterious world that lies under your feet deep below the city. We head through a subterranean canal, deep below the city’s streets which became Manchester’s largest Second World War air-raid shelter. When you get down there it’s damp, dank and dismal. It smells of the dark recesses of the planet. It’s pitch black. Access is not available to the public (or indeed to nearly all the other city tour guides), which is why you’re coming on this tour. 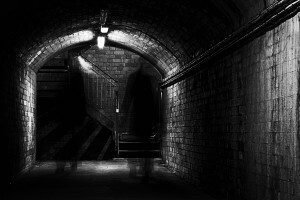 On the Underground Manchester tour we build up to the moment when we go down below with some spine-chilling stories about Manchester in the Cold War, the atomic wars that never happened, and the Second World War that did. We tell you how the city was going to be invaded by the Nazis in 1943 and stop outside where they expected to base their HQ. We then drop down, down, deeper and down into the biggest subterranean shelter in Manchester, built into the long-disused tunnel of the Manchester and Salford Junction Canal, where tens of thousands huddled in safety from the Nazi bombs inside its vast chasmic chambers under the most imposing and imperious brick work you’ll ever see. We eventually head off along the tunnels to find the canal’s waters before they find us. Don’t worry, we do resurface but to a lighter, brighter, finer-smelling world, and follow the route at street level, above where we’ve just been below, until none of us can get any further. It’s a weird and wild world below. Come with us and find out why!